Speak Up 2013 is off and running! So far we’ve had over 25,000 surveys taken- a great start to the survey period! For this throwback Thursday we would like to share all the reports and whitepapers we’ve release this year. All Speak Up reports are available online and can be downloaded at: http://www.tomorrow.org/speakup/speakup_reports.html. 2013 Trends in Online Learning Virtual, Blended and Flipped Classrooms highlights the latest Speak Up data with a particular focus on the role that online learning strategies can play within school and district digital conversions. With the impending implementation of the Common Core State Standards and other new standards, the timing is right to tap into the insights of key education stakeholders to explore both the benefits of online learning as well as how to leverage these tools and resources effectively to transform the learning experience. Since 2007, Project Tomorrow has partnered with Blackboard Inc. to create a series of annual reports that focus on the year to year trends in the use of online learning to change the classroom learning paradigm through an in-depth analysis of the latest Speak Up national findings. In this latest update report, we examine the trends using an inside-out perspective on the classroom and the use of a variety of online learning strategies with students. In particular, we focus this year on the insights and experiences of four key stakeholders: administrators who have implemented online courses within their schools and districts, online learning teachers in virtual, blended or flipped classrooms, parents with personal online learning experiences, and the students who continue to be enamored with the potential of online learning to transform their educational experience. Click here to download the PDF of thereport. Intelligent Adaptive Learning™ is a new class of education technology that personalizes learning. It captures every decision a student makes and adjusts the student’s learning path both within lessons and between lessons, thereby providing millions of individualized learning paths, each tailored to the student’s unique needs in real time. If you think this data is interesting and would like to gain a better understanding about your stakeholders’ perspectives about the use of technology for learning, participate in Speak Up 2013. Speak Up is now open for input and will run through December 20th. Speak Up Surveys are free, and schools and districts can receive access to their school and/or district’s data in February 2014. To take the survey, visit http://www.speakup4schools.org/speakup2013,students will be required to enter in a survey password. Register as the primary contact of your school or district (at the link above) to manage your information, assign a student survey password to ensure confidentiality (all students will need to enter in the secret word to take the survey) and select an administrative password that will be used to access your local participant data beginning February 5, 2014. 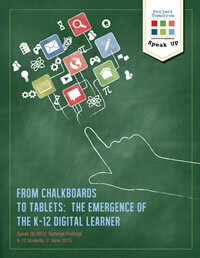 The data will be released on 2/5/14 in celebration of Digital Learning Day! To learn more about signing up as the Primary Contact of your school(s) please click here. Questions about Speak Up? E-mail us at SpeakUp@tomorrow.org. 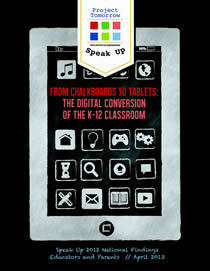 This entry was posted in Speak Up and tagged Flipped Learning, From Chalkboards to Tablets, Learning in the 21st Century: Digital Experiences and Expectations of Tomorrow’s Teachers, mobile technology, Speak Up, Speak Up reports on October 24, 2013 by Project Tomorrow.